The fourth annual Lynchstock Music Festival will be held Saturday, April 23 featuring more than 40 performers to showcase the importance of music and the arts in memory of Jon Gregoire, one of the co-founders of Lynchstock. Lynchstock began in 2013 with around 200 attendees and has seen tremendous growth since then, reaching close to 3,000 people in 2015. Jonathan Smalt, Lynchstock co-founder, said the festival started as a grassroots campaign to meet a need in the Lynchburg community. Smalt said the second year was when they saw real potential for the festival’s growth, increasing from 200 to 1,000 attendees. It was around that time when Gregoire passed away. After his passing, Smalt said he had to decide if they would continue the festival without him. He has been running the event with a team of about 10 people for the last year. Most of them live in Lynchburg, but Smalt coordinates a lot of the festival from his home in Nashville, Tennessee. He said that the festival has never been about the money, but it has always been about bringing new opportunities to the artists and the community. This year’s festival will see 32 musical acts and 10 spoken word performers split across three stages throughout the day. Each stage is within walking distance from the others, so attendees can listen to whichever act they prefer. 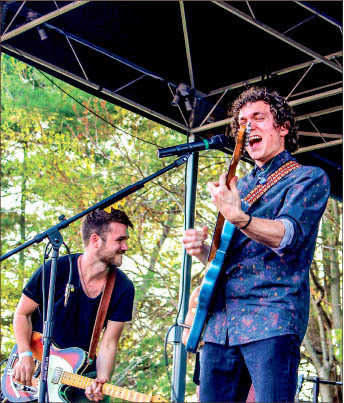 One of the bands performing, Jake Ziegler and the Locals, is comprised of Liberty students. Ziegler, their guitarist and lead singer, said Lynchstock is shaping up to be a fantastic experience. Ziegler said their band plays classic rock ‘n’ roll and will be showing off a lot of original material. He said their goal is to entertain the crowd. Smalt said in addition to the music, there will be craft vendors, food trucks and a live painting of a mural. He also said at the end of the night, they are going to close the festival down and turn it into one huge hip-hop dance party. The festival will be held at Benjamin’s Restaurant, which is located at 14900 Forest Road, Forest, Virginia. Tickets can be purchased online at www.lynchstockmusicfestival.com/tickets or at the door the day of the festival. Smalt said they are always looking for volunteers to help put on the event, and for anyone interested, they can apply at www.lynchstockmusicfestival.com/volunteers. A full lineup of performers can be found at www.lynchstockmusicfestival.com. GEE is a news reporter.